Federico, cworth and I came up with a patch to Cairo that greatly improves the performance of GTK+ applications on X servers without the RENDER extension. In this case the profiler didn’t really help much, it just showed that all of the time was spent in the X server. The real progress was made when Federico just made a guess on IRC, asking about how gdk_window_clear_backing_rect() goes through to cairo, and how the RENDER fallback code worked. I think we were very lucky here. It’s hard to know whether it’s worth investigating performance on X servers without RENDER. While some people care a lot about these configurations, it is tempting to just let them deal with it. That’s the “open source” way, right? However, I found it disappointing to see how easy Federico’s steps were to recreate the problem, how obviously broken it was, and how simple the fix seems to be. I got sysprof up and running tonight along with Federico‘s latest patches to Pango. Just looking at the shaper, it’s getting much harder to find things to optimize. Still, we had a great time trying. Sysprof is really fun to use, and it was fun hanging out on gimpnet #performance. Using gcc-4.0.2 and -Os, the memcpy() was added by the compiler to copy some PangoRectangle structures. I expanded those to just copy the individual fields, and the time basically went to 0. While I suspect this was just a side-effect of -Os, expanding the copy is easy and I don’t think it hurts the readability of the code. Maybe we should consider it. The more interesting optimization was with the hash table used to cache the glyph extents calculated through Cairo. It starts at a size of 11 and grows by primes, using the glyph index as the hash. The patch to Federico’s latest thing can be found over here: new-cache.diff. In case you’re having trouble, my current cvs diff for pango is here: my-pango.diff. Sysprof is great, and the tree view UI makes it quick and easy to narrow down performance issues. The call stack information is invaluable, and being able to quickly sort the times is awesome. 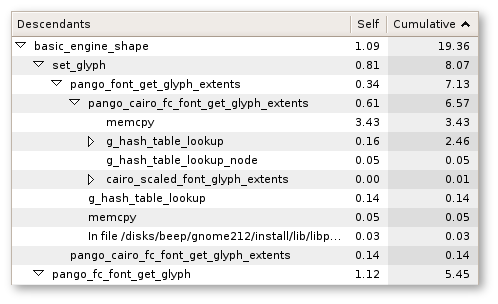 OProfile, like sysprof, is a kernel-level profiler which I’ve been using for working on cairo. While it lacks sysprof’s UI, the command line interface can be handy, and the resulting data is very raw and believable. The opcontrol commands are run as root, while the benchmark can run anywhere. OProfile gathers data for the entire system. OProfile can also generate annotated source code based on this information. The annotated code very visually shows which code paths get hit. All of the data here is from a simple text measuring benchmark under pango 1.10.1. I had to build pango without inlining to show which functions were really doing the work. This slows the benchmark down, making it more difficult to evaluate changes. Only use the non-inlined results as a guide.